MGA was born in 1839, the ultimate proof–ROR of June 1906 (See page 229). Muhammad Ali most likely wrote this essay, since he was the editor at the time. As soon as MGA died, they began casting doubt on this topic, see ROR, June–1908 (see page 227 and 235, they assert that MGA was born in 1837), whereas all neutral newspapers asserted that MGA was born in 1839. 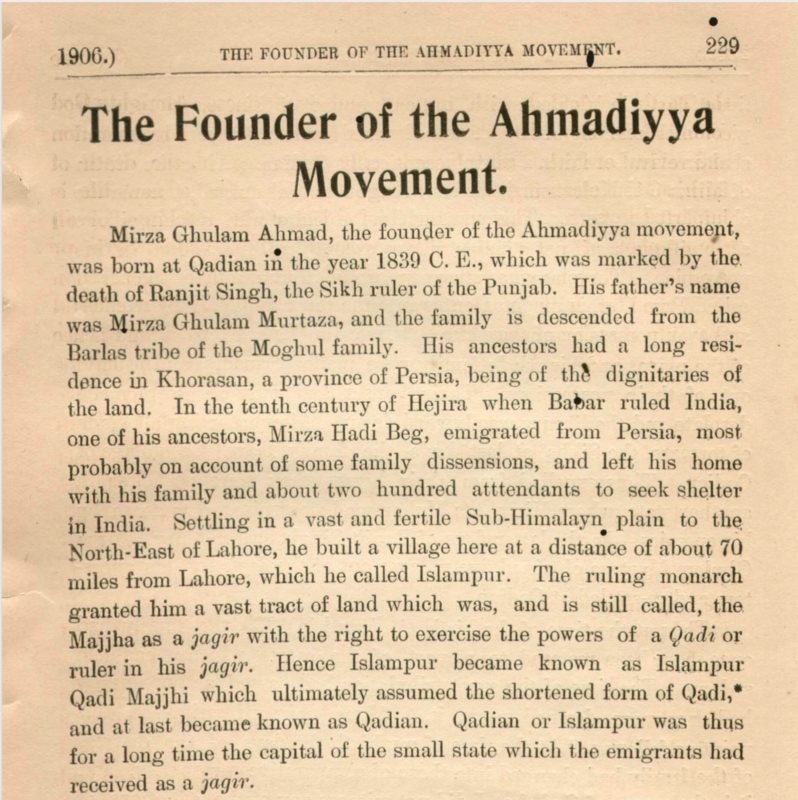 Later on, in 1917, Muhammad Ali wrote again that MGA was born in 1839 in a book about the founder. However, the 2nd, 3rd, and other editions changed the DOB. They seem to have colluded with the Qadiani’s in this regard, since it was Mufti Muhammad Sadiq who officially changed the DOB, in concert with the sons of MGA. In those days (the 1930’s), they were cleaning up all the errors and omissions of MGA. In fact, even the Punjab Chiefs, written by an employee of the British Government confirmed that MGA was born in 1839 (see 1909 edition). In 1917, the Khalifa, Mirza Basheer-uddin Mahmud Ahmad wrote a book entitled “Hazrat Ahmad”, in this book he quotes the 1910 edition of the “Punjab Chiefs” in it entirety as they cover the Mirza family (see pages 11-12), the original urdu edition of 1916, the first english edition came in 1917, both of those editions carried 1839 as it was “direct-quoted” from Griffin. However, the subsequent editions began to gradually change it, by the 1998 edition, 1839 was totally amended to 1835. “Although Mirza sahib had not received systematic education in current knowledge and theology, yet an assessment of his life shows that he had a unique nature not granted to everyone: by the aid of his own study and his upright nature, he had attained sufficient mastery over religious literature. In about 1877, when he was 35 or 36 years old, we find him charged with unusual religious fervour. He is leading the life of a true and pious Muslim. His heart is unimpressed by worldly attractions. “The state of ecstacy created by reading his invaluable books which were written to counter other religions and to uphold Islam, still has not faded. His Barahin Ahmadiyya overawed the non-Muslims and raised the spirits of the Muslims. He presented to the world a captivating picture of the religion [of Islam], cleansed of the blots and dust that had collected upon it as a result of the superstition and natural weaknesses of the ignorant. He claims to be 67 in 1905.